Formula One’s livery reveal season is upon us, and boy are things really starting to heat up. With testing taking place later this month, everyone is scrambling to show off their cool new outfits at the first day of school. But the teams that haven’t given us their first look at new threads might as well pack it up and go home, because Red Bull Racing is undoubtedly the coolest kid in class. Haas, Renault, Toro Rosso, Williams—they’ve all had their livery launch parties, getting in on the action before anyone else could show them up. But Red Bull haven’t even officially launched their new car, the RB15—this is just a teaser, if you can actually believe that—and they’ve already proved they know a thing or two about a good looking car. Every team who hasn’t released their 2019 car can go home. Red Bull wins. Thank u, next. This season, they’re donning something Red Bull calls a “Special edition livery... thanks to the arrival of Honda power and an exciting new driver pairing,” according to their website. They’ve done a damn good job. 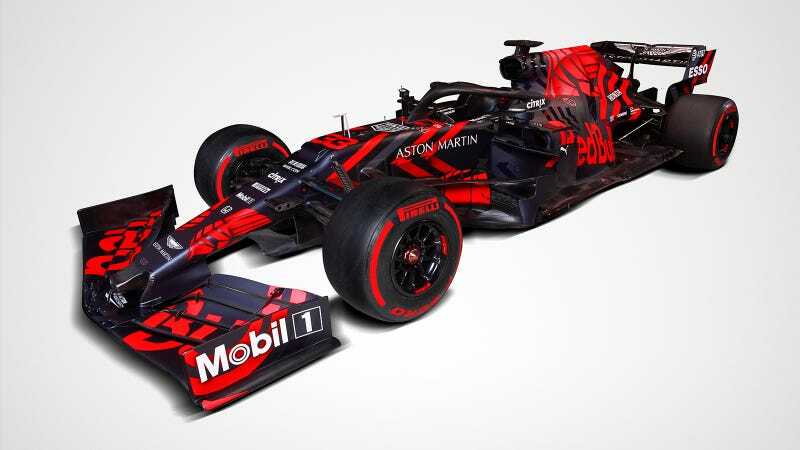 After dropping their relatively sedate blue and purple paint scheme, RBR has opted for an aggressive red and black look. The Red Bull branding is all still there, but it’s stylized in a way that makes it look like the album cover of a punk band. Which is pretty damn cool. The words “special edition” give me reason to pause—it’s a pretty vague phrase that could imply this livery isn’t going to be here for a full season. If there’s anything F1 has taught me, it’s never to get excited for a good thing (and yes, I’m looking at you, my beloved Marussia F1 Team). But this livery has me amped. It has me willing to forget all of F1's past transgressions. It has me excited for the race season in a whole new and beautiful way. It is the livery I'm going to mentally project on the Red Bulls all season long. The newly outfitted RB15 will be taking to the track at Silverstone later today. Keep your eyes peeled for all the beautiful shots of this bad boy in action.